For live delivery guarantee: if your temps are below 55 or above 85° the "Hold for Pickup" button must be checked above! We ship your hornworms in a habitat with food enough to last one week. If you are planning to grow your hornworms to full size you will need additional food when purchasing the 25ct. The 25 count cup has less food and less growing area for the purpose of feeding while the worms are still small. The 12 count cups has more food and a longer cup for the purpose of growing your worms to a larger size. Hornworms are perfect for the fussy eater and are known to be the 'magic trick' to end a reptile's hunger strike. Not only are they an enticing blue-green color but they are very high in water making them a great way to rehydrate your animal. A. Growing and adult bearded dragons, leopard geckos, uromastyx, amphibians, tarantulas, and scorpions, but chameleons especially love them! They are high in calcium, low in fat, and have no chitin (exoskeleton) making them easily digestible. Q. What is their nutritional content? Q. I want to take them out and feed them plants, what do they eat? A. Although in the wild they eat plants in the Nightshade family, these plants contain toxic alkaloids that will build up in the worms and may harm your animals. For the same reason, you should only feed your pets cultivated hornworms, and not pick them from your garden. Q. How much food should I plan on them eating? A. 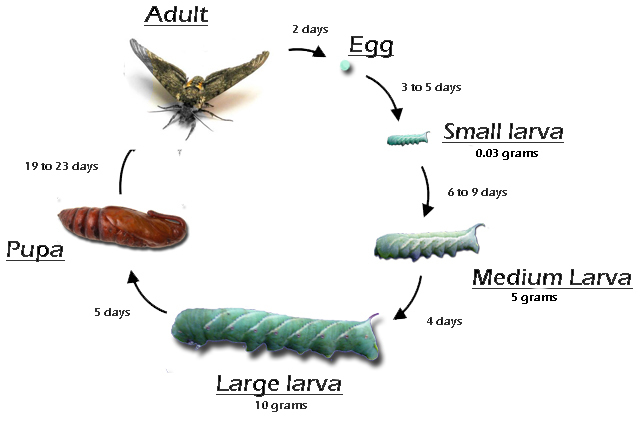 Each hornworm will eat roughly 1 oz. of prepared food to reach full size before pupation. For every 16 worms, you will need one pound of prepared food. Q. What will the worm change into? A. 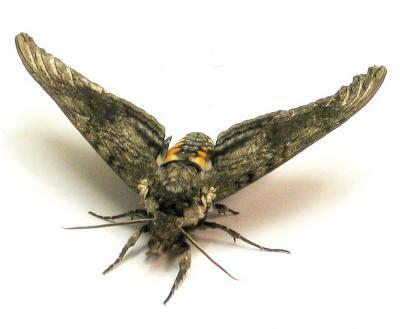 They will change into a beautiful moth known as the Sphinx or Hawkmoth. The wingspan is 4 to 4.75" long! Q. How big will they get and how long do they live? A. 3" to 4" long and weigh 10 to 12 grams. They live two to three weeks depending on how warm the environment is. Q. Will that horn hurt my animals? Should I remove it? A. No, it's just a colored piece of flesh to deter predators, it's harmless! Q. Last time my hornworms were big, this order they are tiny. What gives? A. At certain times we pick our hornworms smaller to ship (for example very hot weeks or when we expect USPS to take longer than the usual 2 to 3 days). If you leave them at room temperature, on a hot day they will grow about one half inch a day. If you choose USPS Priority as your shipping method, it can take up to 5 days and we don't want your worms to be the size of thumbs and unusable when you receive them. If you leave them out of the fridge, they will very quickly grow to the size you'd like and then you can refrigerate them in a warmer spot of your fridge to halt their growth.